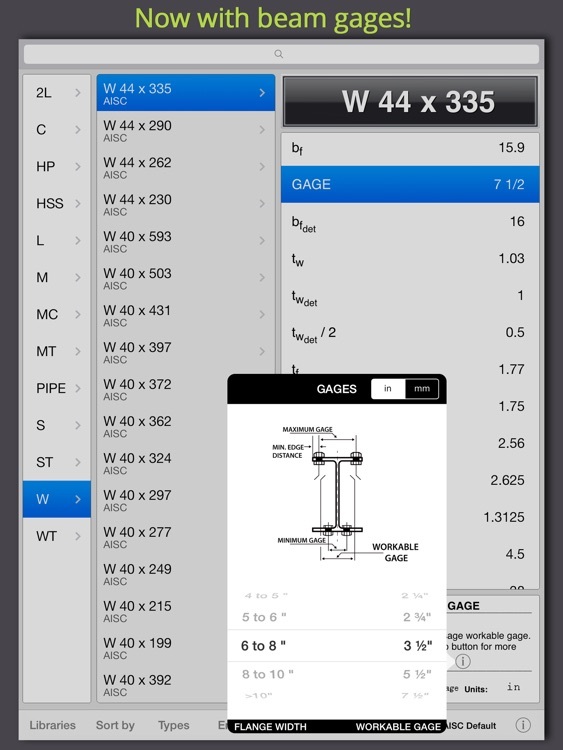 The best mobile structural steel reference for iPad! 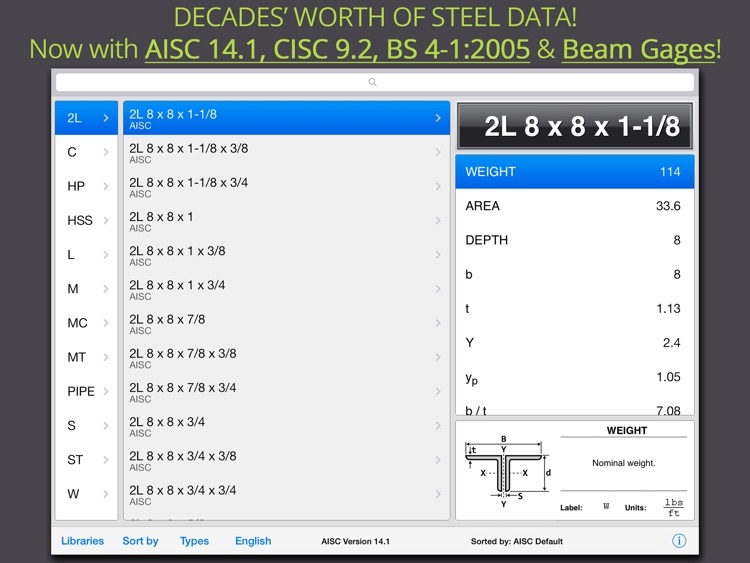 [steel shapes] hd contains all libraries from [steel shapes] (AISC 14.1, 14.1-SI, 14 & 14-SI, 13.2, 13.2-SI, 13.1.1, 13.1.1 SI, 13, LRFD 1 through 3, ASD 5 through 9 and historic sections), [steel] Canada (CISC 9.2) and [steel] UK (most common british sections according to BS EN 1993-1-1:2005 / BS 4-1:2005) adapted for the ipad's spacious screen. 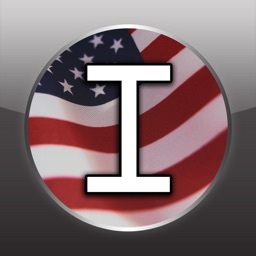 FULL USE OF SCREEN REAL ESTATE: no need to switch between designations / details / library switching and sorting pages as in the iphone. 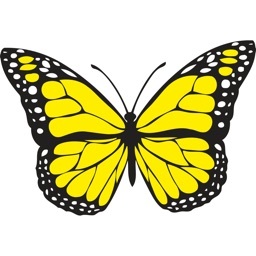 All information and features are immediately accessible from the main screen. 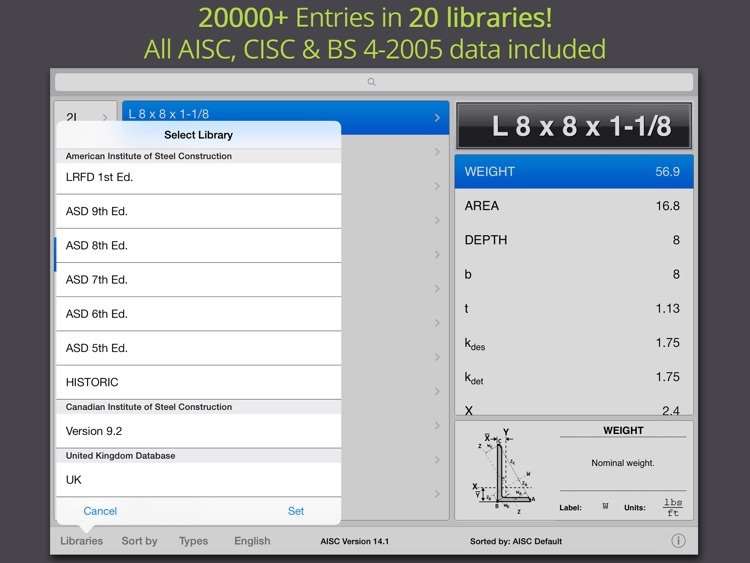 Includes all libraries from [steel], [steel] Canada and [steel] uk. 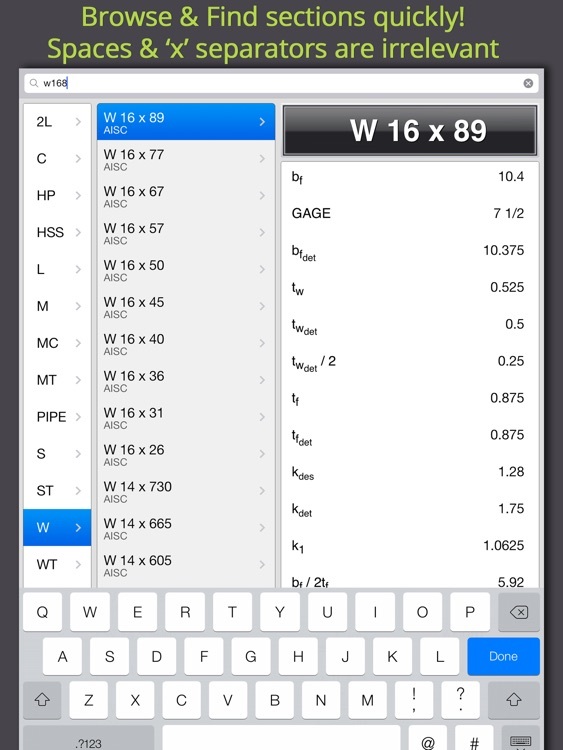 Decades' worth of steel data at your fingertips. - ASD 5th through 9th Ed. 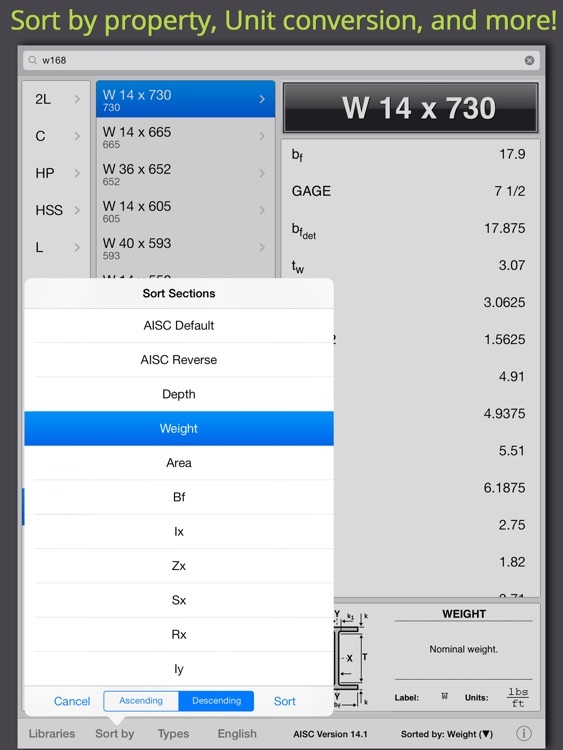 [steel hd] lets you find a section with a quick search function, where, for example, "W16 x 89", "W16x89" or simply "W1689" will locate the same section or its closest approximation. 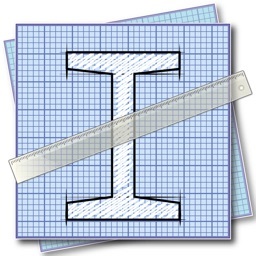 ** [steel] the best structural steel reference tool for iphone / ipod touch, containing decades' worth of AISC data (everything from HISTORIC sections to V14 & in between). 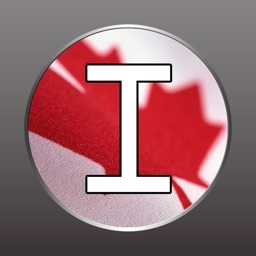 ** [steel] canada: steel reference tool for iphone / ipod touch containing CISC Data. 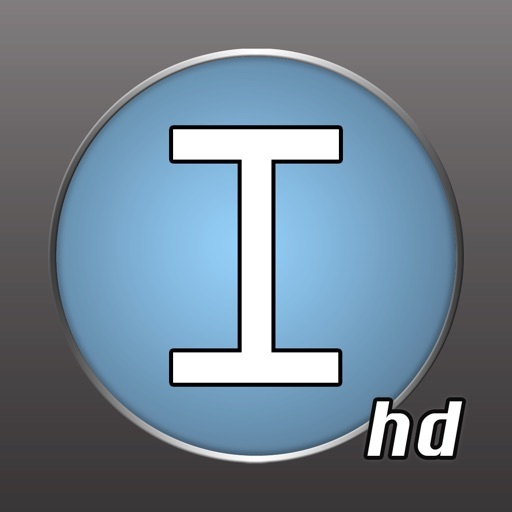 ** Metals and Materials Weight Calculator: an easy to use weight and basic properties calculator for metals, plastics or other materials. 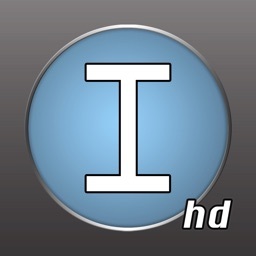 ** GaugeFinder: a database of the most common gauge sizes standards used worldwide.